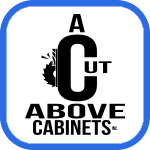 A Cut Above Cabinets gets a redesigned website! After a refocus of our product offering and a desire to integrate into social networking, A Cut Above Cabinets has decided to move forward with a newly redesigned website. Also, check out our updated Facebook and LinkedIn pages.